Skull base refers to the area of the skull where the brain rests. Skull base surgery, sometimes called cranial base surgery, involves removing tumors. Contained within the skull base are the eye orbits, ear canals, two carotid arteries, two vertebral arteries, 12 cranial nerves and the blood drainage system of the brain. These many intricate structures make the skull base one of the most complex areas on which to operate. Two kinds of disorders may make skull-base surgery necessary for patient. The first, vascular lesions include aneurysms, malformations of the veins and arteries, and fistulas. The second are benign and malignant tumors. 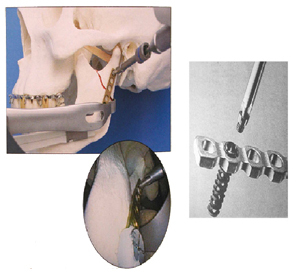 Skull-base surgery involves operating within one of three regions of the skull: the anterior, middle or posterior fossa. Neurosurgeons who work within these areas must approach each in a very specific way with regard to the size and type of lesion to be removed. Because of the delicate nature of this type of surgery, patients may be in the operating suite from six to as many as 15 hours or more. 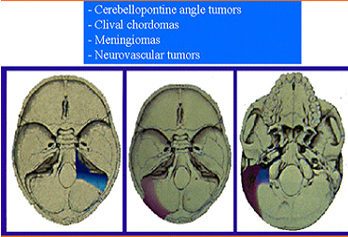 With this technique, preoperative images of the patient's skull base and the tumor are obtained using computed tomography (CT) or magnetic resonance imaging (MRI). These images then help to guide the surgeon during surgery, acting as a type of navigation tool and confirming the patient's anatomy and the precise location and extent of the tumor. A high-power microscope with a stable, anti-vibratory base mount is important for proper visualization of vital structures. A high powered drill with a wide assortment of burrs is essential, as it is critically important to be able to navigate around each nerve and blood vessel. Delicate microsurgical instruments in a wide variety of sizes and angles, such as hooks, scoops, scissors, and probes, are required. These permit atraumatic microdissection of the tumor off the vital structures.